A large section of the back wall of the house has been removed to make way for the large thermally broken aluminium glazed sliding screens. 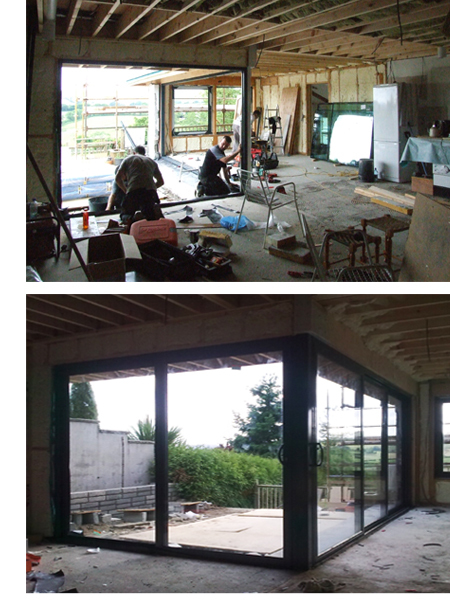 The 2 new south / south west facing sliding screens (one of which has a double sliding section) will be the key components which will flood the new spacious open-plan kitchen / living / dining space with light whilst also opening the internal space up to the breathtaking views of the surrounding countryside. The glazed sliders will open onto a new large external deck, the level of which will be raised up to the internal finished floor level. The quad of 4no. centre pivot ‘FAKRO’ tripple glazed roof lights have been installed in the new ‘snug’ space at 1st floor. This space at 1st floor forms a mezzanine which overlooks the new entrance space below. The introduction and positioning of the 4 large south facing roof lights above this space will mean that light from the south will now flood the north facing entrance hall at ground floor which was previously a dark unwelcoming space. We will upload some more photographs as the new hall space takes shape over the coming weeks. This week saw the installation of the ‘intelligent’ membrane to the internal face of all external walls and roof surfaces. 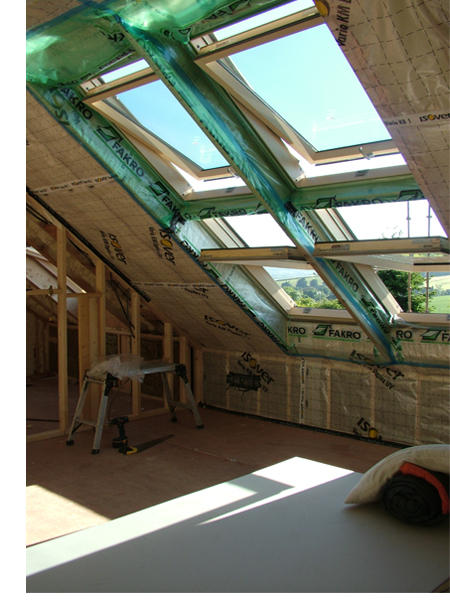 The innovative VARIO system intelligently adapts to the temperature and humidity within the building (blocking moisture that diffuses into the structure from inside the building in winter, whilst allowing the trapped moisture to diffuse harmlessly into the building interior in summer). During summer, the climate membrane allows 25 times more moisture to escape from the building structure, than penetrates into it during winter. This ensures the construction dries out effectively and moisture-related damage is avoided. 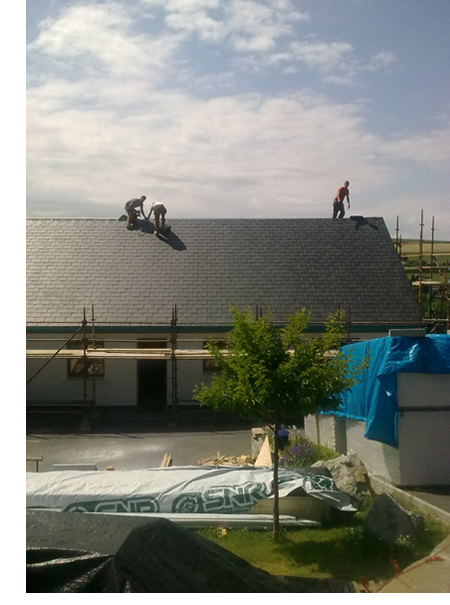 Installation of the new ECO slates is complete. The new roof finish has achieved the desired sharp & clean look. 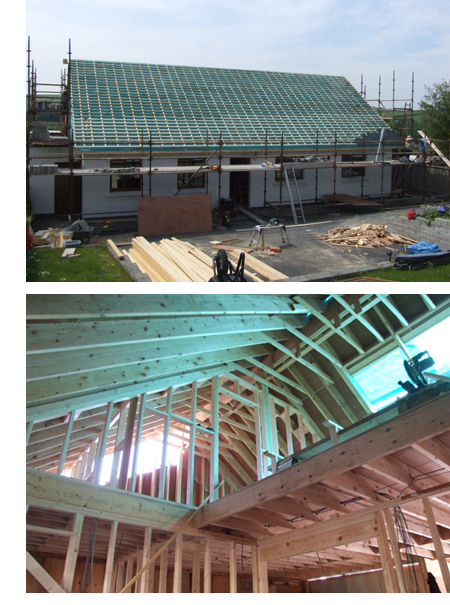 Now that the majority of the mechanical and electrical first fix is complete, the spray foam insulation can be installed to the full extent of the timber frame structure. 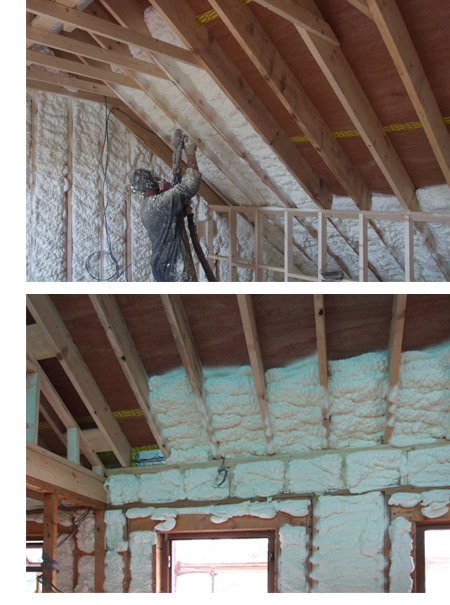 Once the installation of the spray foam insulation is complete, an airtight or ‘intelligent’ membrane will be installed to the internal face of all external walls and roof. 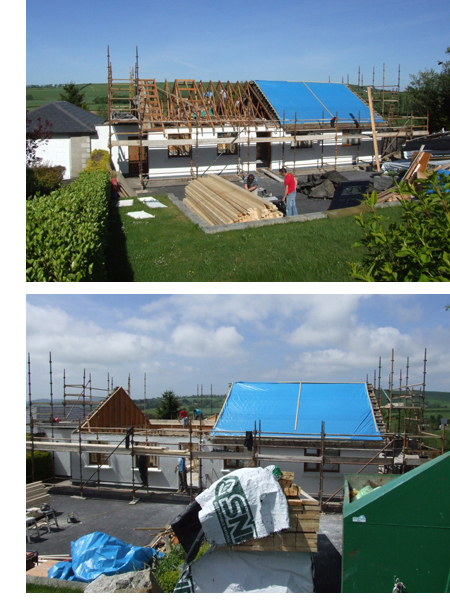 We will post some photographs and information on the Isover membrane installation next week. The new cut roof structure is sheeted with marine ply and the new ‘FAKRO’ breather membrane is installed above this. Batons and counter batons are then fixed in place and the new recycled roof slates are laid. Internally, the new timber stud walls are erected and the new layout begins to take shape. Once the new stud partitions are complete, the electrical and mechanical first fix can progress. The new ‘cut roof’ starts to take shape. At the beginning of a week of good forecast weather, the existing roof truss’s are removed and preparation is made for the new cut roof to be constructed. The original roof tiles have been stripped back and temporary waterproof sheeting is positioned to protect the dwelling. 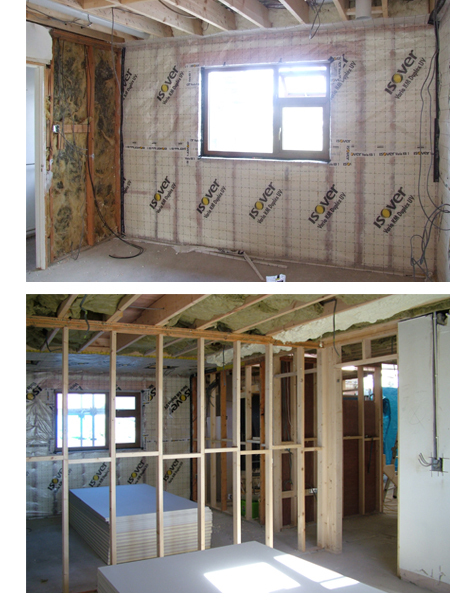 The house has been stripped back to expose the timber frame structure internally. Due to the fact that none of the internal stud walls were of structural importance, these too have been deconstructed to make way for the new open plan internal layout. 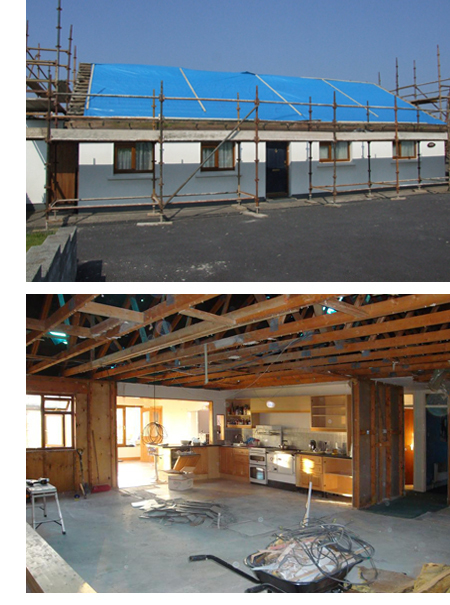 The coming days will see the existing truss roof structure removed to make way for the new ‘cut roof’. 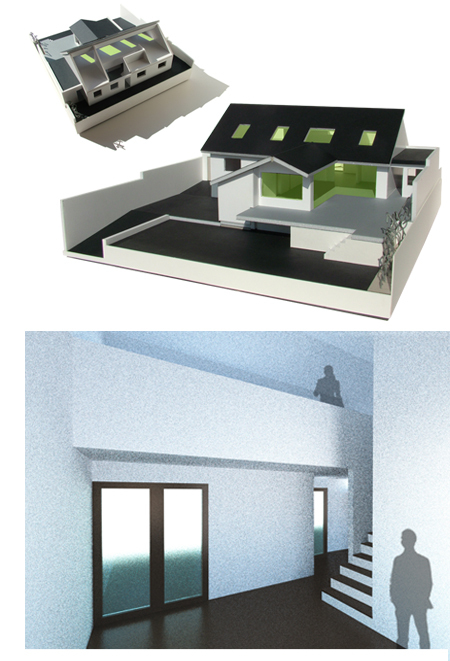 As noted in our previous blog post, the main area of focus in this project is to significantly improve the thermal performance of the house. However, in order to achieve this, the scale of the work involved will provide an opportunity to significantly alter and improve the design of existing house both internally and externally. 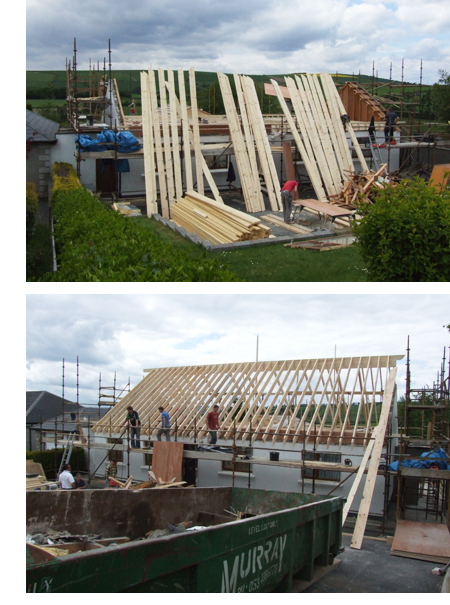 – the existing truss roof will be deconstructed and replaced with a new ‘cut roof’. The new roof structure will provide an opportunity to introduce a generous double height entrance space in what was previously a dark and unwelcoming entrance hall. The positioning of 4 large south facing roof lights above will mean that light from the south will flood the north facing entrance hall at ground floor for the first time. – The original separate living, kitchen and dining rooms will be replaced with a new contemporary open plan living space. – A large south facing section of the rear wall of the house will be removed and replaced with 2 large glazed sliding screens. These screens will have the dual effect of flooding the previously small and dark spaces with light whilst also bringing the breathtaking views of the surrounding countryside deep into the heart of the new living space. These sliding screens will open out onto a new large external deck area to the rear. – 7 large south facing roof windows will be introduced bringing light into the new first floor spaces and the new entrance space. – A separate ‘snug’ living space will be introduced at 1st floor, again taking advantage of the views of the surrounding country side through the 4no. large centre pivot roof windows which will be positioned together.